My own humble little contribution 32x32, 16-colors (Windows 16-color palette), white is transparent in the actual icon included in the ZIP file. Also, a little joke animated GIF... I was simply dying to post this somewhere ! Regardless of how late i am (which is 14 years :p) i made these just for fun, so if you wanna try something different instead of default these might be an option. Though as you can easily see i am no expert at logo making nor pixel art and i actually share this more for an actual professional to see and make better version than mine, so it could be useable. Also at the bottom parts of the workspace you can see there is a section with a light blue color, that idea was cool however i am not talented enough to do that but it would be lovely. Can you also do more "authentic" version of this one :p? I really like this one however i am no pro at pixel art.. in fact i am no pro at any form of digital art :p So id be extremely glad if someone else who knows what they are doing touches it. I looked at that one as well but the DOS design works because the letters loops around eachother. An X can't possible loop and the B has a much smaller hole. The easiest way to fix it, is to just not loop and have the letters B and X overlap the O in the middle. I could try and see if it looks authentic enough like that. Well i struggled with B too but cant X do this around O? But yeah, why not i would love to see the non looping version as well. Well you got to respect the distance of the letters - by pushing the X so into the O, the distance with the B would look wrong. Even spacing of the center of the letters is important for balance. I'll see if I can make a good looking logo next week. red_avatar wrote: Well you got to respect the distance of the letters - by pushing the X so into the O, the distance with the B would look wrong. Even spacing of the center of the letters is important for balance. I'll see if I can make a good looking logo next week. Thank you very much, i'll be waiting. edit: just came to my mind but, how about stretching O a little bit? 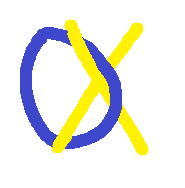 Inspired by the current logo, it's got the crossing of B and X above and below the O of DOS, but I slightly offset them. I think it needs work -- the weird sizing and offset do look kinda ugly, and arguably it's a bit busy -- but... Thought you might enjoy the concept. ... Does anyone else see this as reading as "DOGBOX"? I also see the dogbox tbh :p especially on the little versions. I think the reason of that is the O got a bit too squished so S gots a little weird and gets readen as G.
You may also try what eobet did back in 2005 with the ms dos logo pixelated aesthetic instead of making the B and X gray and small. leileilol wrote: too clumsy, too dangerous. I think the point is that my mockup was a bad idea, and eobet's is also somewhat questionable. To be honest, I'm not overly pleased with my result... Clumsy sounds like a good descriptor. Eobet's is, I would say, a lot closer to the kind of thing this idea would have to resemble, but I'm not sure this really is a direction worth going. I don't think you could get it down small enough while still looking both good, and recognisably similar to the old MS-DOS logo. 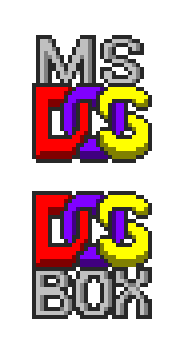 Could try keeping the colour scheme of the DOS letters if you want to go for a variation on the cross design as used in the current icon that tries to have a general look/feel more similar to the old MS-DOS logo, but keeping them intertwined and at full size isn't going to work. Though I must say, I am growing on this one. If a more MS-DOS logo-esque one was wanted, this is probably the way to do it. Having said that, I'm not a big fan of the dithering in the purple, if I'm totally honest; the one red_avatar put up at a larger size is undithered, and looks nicer for it, if you ask me. 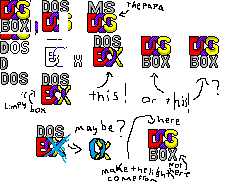 The one you use as your avatar is nice, since it's stacked like the old MS-DOS logo, but I don't think BOX intertwines as well as DOS does, so this is probably the best way for that approach. I used the floppy disk icon from pages ago to create a shortcut to launch. Pretty neat.